Circa 1949, when Gore-Tex was a long way off, layering wool was the only way to attempt to ward off the frigid temperatures. Factor in an hour-long lift line and a 30-minute ride up what was then the world’s longest chairlift—with single seats—and idle time adds up to freezing digits. If there’s anywhere in America that showcases how skiing has evolved from its humble origins, it’s Aspen. In 1950, it was a sleepy ranching and mining town when it hosted the first worldwide skiing competition held in the United States. Today, the four resorts that make up Aspen-Snowmass have a combined 41 lifts serving 5,500 acres of terrain. But there’s a lot more about skiing that has changed, in Aspen and across the world, than just the size of the resorts. Here, a look back at the olden (and some might say golden) days of skiing—and how things are different now, from incredible improvements in gear and technology to the not-so-incredible price hikes, and everything in between. Back in the day, a solo trip up the lift was the only way to go. On Dec. 15, Snowmass will celebrate its 50th anniversary with $6.50 lift tickets, honoring the price from 1967. Resort officials were reportedly shocked when they sold some 12,000 of them by early November, and subsequent sales required a lodging purchase. The popularity might be in part because lift tickets in peak season can top $150 here. 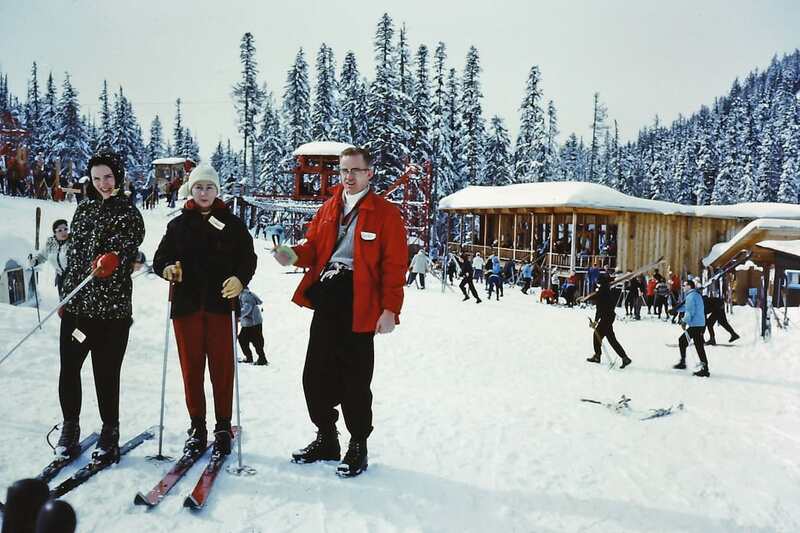 Of course, nothing is as cheap as it was in 1967, but the cost to hit the slopes at big resorts has risen astronomically. Nowadays, a family ski trip can easily run into the thousands of dollars (though, by choosing more old-school resorts, you can help your budget a bit; more on that below). Ski fashion has come a looong way over the decades. In the old days, breaking an ankle or fracturing a leg was almost a rite of passage for skiers. That injury rate was due in part because of the gear: Skis were long, skinny, and fast, and didn’t release during a crash—which happened a lot, because they were not ideal for turning, especially in deep Colorado powder. Over the years, boots got stiffer, bindings safer, and skis shorter and wider. 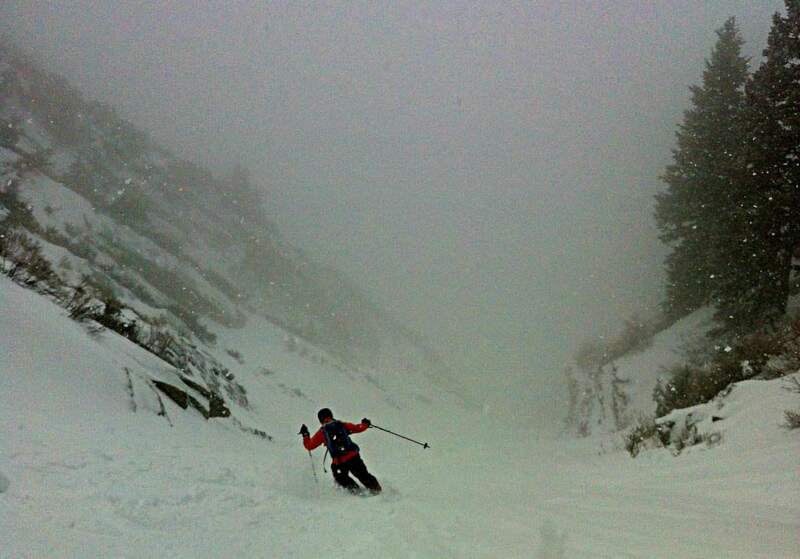 But like many skiing innovations, there’s a downside to making it easier and more fun to ski powder. The hill gets tracked out quicker, including the trees, which used to be too dangerous for sloppy-turning skis. Cell phones have revolutionized the way skiers can document carving it up on the slopes. In the old days—in this case, before everyone had a cell phone in their pocket and a GoPro on their helmet—skiing offered a way to disconnect. If someone needed to find you while you were on the slopes, too bad for them, but good for you—you were essentially off the grid until the lift lines closed. Sure, there’s an upside to all this access: You can instantly get the snow report, check what others are posting about conditions, or upload a lift selfie or GoPro video of your powder run. But something is unquestionably missing—that feeling that it’s just you and the mountain. If you lost your friends, you knew you’d meet up again for après at the bar, where an in-person account of that epic line you hit beats an Instagram post any day. As for another noteworthy technological innovation, the automatic pass scanner, you’re not likely to find many skiers or lift attendants pining for the old days of punching tickets. Many resorts, including Aspen Highlands, have expanded their terrain over the years. 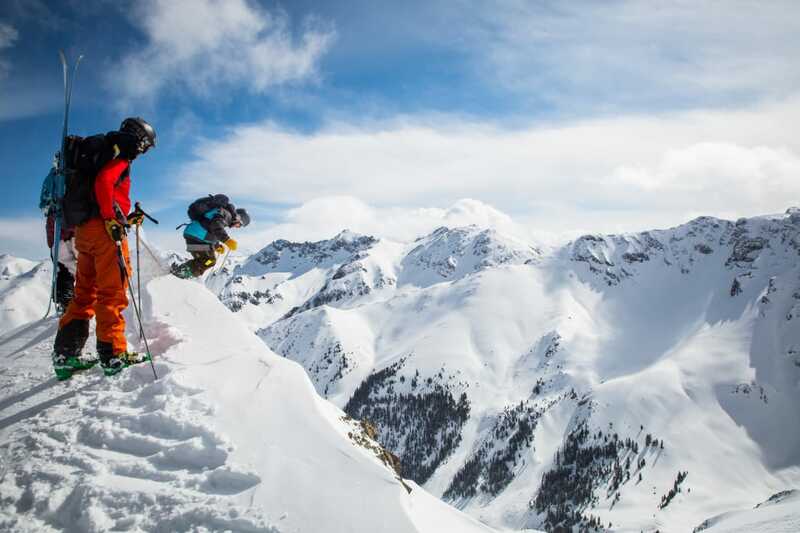 Today, it’s the crown jewel of extreme terrain of the Aspen Highlands resort, reached only by hiking, double-diamond terrain that has been called the most intense skiing in Colorado. There’s a monument to three patrollers killed in a 1984 avalanche up there. Wider skis and adrenaline junkies chasing more extreme terrain have led many resorts to allow access to this sort of avalanche-prone terrain above timberline, the slide risk mitigated by modern avalanche control techniques. An off-duty cop or killer costume? You decide. Just as depicted in the classic ski film Aspen Extreme, every winter a new cycle of would-be ski bums arrives in town. The cars have changed—now it’s more likely to be a Subaru stuffed with worldly possessions instead of an old Ford van—but Vagneur still sees the same types year after year: the guy with a PhD washing dishes in a restaurant by night, trust-funders living in a fantasy world, A-listers who come to Aspen to see and be seen. The days are gone when they all knew each other or recognized each other at the bar from riding the lift together. The resorts are too big; the population too transient. And fast-moving lifts mean a conversation that might have taken 20 minutes is over in five—and that’s if you even manage to chat with someone who’s tapping away at their phone the whole way up. You don’t have to look too far for a throwback experience. 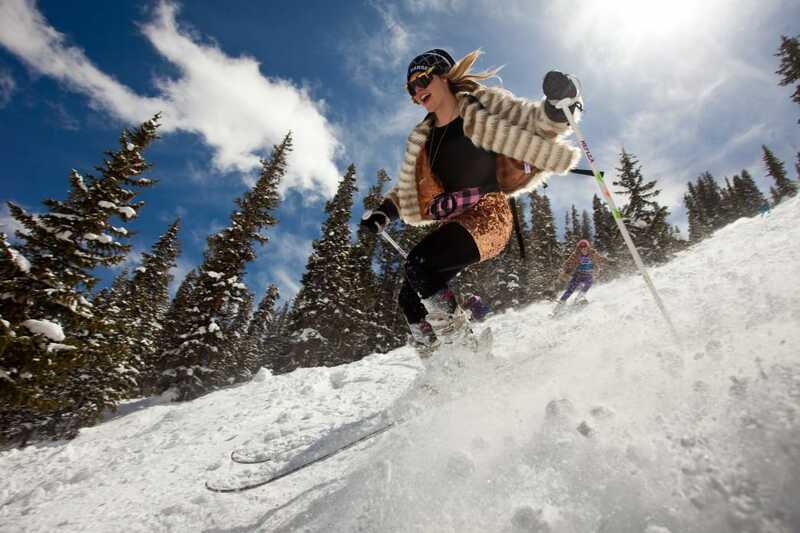 Craving an old-school ski experience? Here are five ski resorts and towns where you can travel back in time for a nostalgic day on the slopes. If you live in Bozeman and see the blue light atop the Baxter Hotel flashing, it might be time to take a “sick” day—because that means this nearby ski area has fresh snow. Locals are the bulk of those on the slopes, since most visitors opt for snazzier resorts in the northern Rockies, like Jackson Hole. But that’s all the more reason to book a trip, since Bozeman is mostly a summer tourist town and rooms are cheaper in winter. “Ski it if you can” is the well-known slogan for this rustic ski area, which has the gnarliest terrain in New England. It’s also skier-owned, which means you don’t buy a pass but a share in ownership that gives you a voice in how the area is managed. 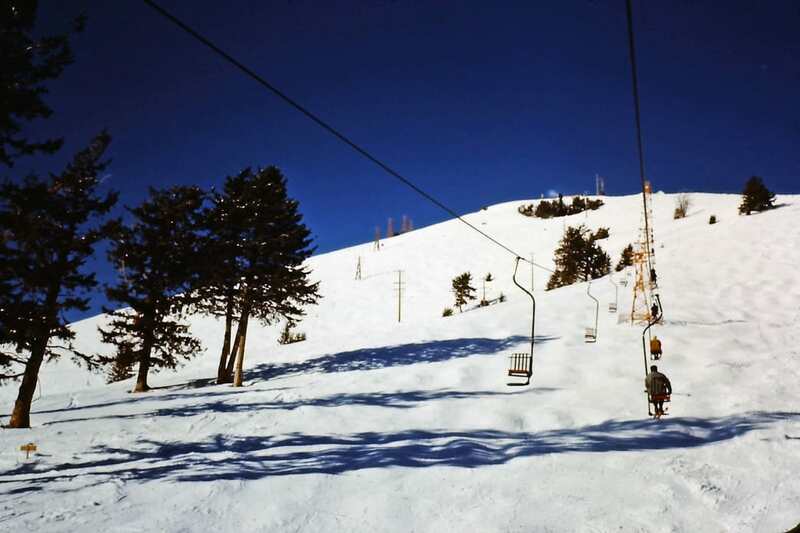 It also has one of only two still-operating single-seat chair lifts in the United States. You don’t have to drop a fortune to ski California’s crown jewel at this family-friendly resort at the west shore of Lake Tahoe. Enjoy jaw-dropping views like other Tahoe resorts—the lifts begin almost at the shores of the lake—without the steep prices of other areas. So many modern ski resorts focus on real estate as much as the skiing, but you won’t find a slopeside condo here—just lots of wide runs, a laid-back vibe, and excellent skiing. You won’t find many ski areas whose owner is up the ridges with a snorkel, dropping avalanche bombs. 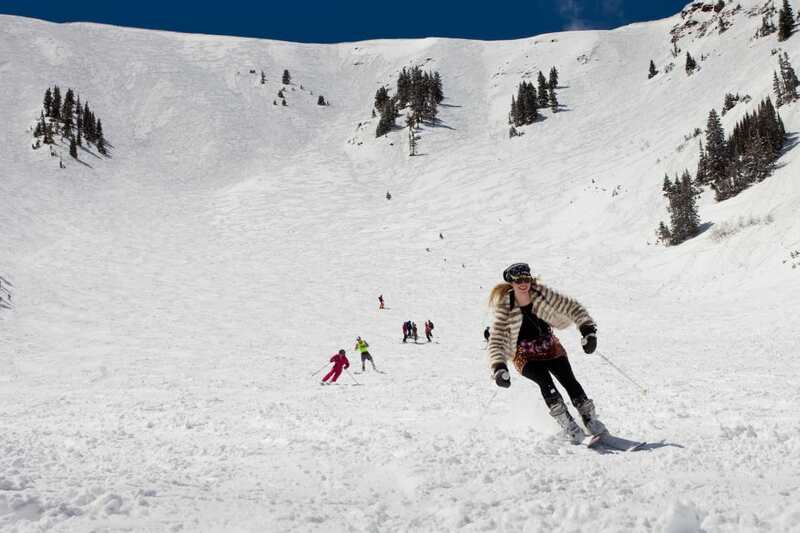 This southern Colorado resort is known for its rustic vibe and deep powder, and with 450 inches a year, they claim to have the most snow in Colorado—130 inches more than Snowmass, for a lift ticket ($70) that’s less than half the price. Lines are unusual, and powder lingers for days for those willing to hike a bit. Written by Scott Rappold for RootsRated. Winter has finally decided to show up in Vermont, and now that the temperatures have dropped and the white stuff has started to fall, the call of the slopes can be answered. Luckily, there are a handful of options within an hour’s drive of downtown Burlington. So grab your gear and figure out which mountain will keep you happiest as you shoosh through the powdery stashes you’ve been waiting for since November. Big things come in small packages, and Cochran’s Ski Area is no exception. While it’s the smallest mountain on the list, Cochran’s churns out Olympic skiers and medal-winning racers like no other. The nation’s first nonprofit ski area is owned and operated by the legendary skiing family, the Cochrans, and has a mission of “no child will be denied the opportunity to ski or ride.” Located in Richmond about 20 minutes outside of downtown, Cochran’s is where most local kiddos get their start on the slopes. Cochran’s has two rope tows, night skiing, and an amazing community vibe. Nestled in the middle of the mountain-top community of Bolton Valley, Bolton Valley Ski Resort is a local favorite. It has an average snowfall of more than 300 inches, and its 6 lifts and 71 runs—including three terrain parks—keep both novice downhillers and expert veterans entertained. If the inbounds skiing isn’t making the grade, Bolton has some of the best backcountry around—skin up and explore the variety of off-piste trails, take a lift up and ski off the back, or enjoy the challenging glades. And the best part about it, it’s affordable. Families can ski here together without breaking the bank, and there are awesome deals for college students throughout the season. To add to it all, Bolton has night skiing, a nordic center, and a sports center where you can take a dip in the pool or lounge in the hot tub. Stowe Mountain Resort is one of the biggest draws in the area for tourists during ski season. Located on the side of Mount Mansfield just outside the bustling downtown Stowe, this upscale resort is a massive winter wonderland come true. The skiing and riding is incredible with 13 lifts, 116 trails, and 485 acres of skiable terrain. The lift lines here can get long, especially for the summit gondola, but it’s worth the wait. The views at the top are unreal, and the ride down isn’t so bad either. And if hitting the slopes isn’t your thing, there are numerous other activities you can participate in right on the property, including ice skating, cross-country skiing, relaxing at the spa, or enjoying a meal at the Cliff House, Stowe’s own cliffside restaurant on the shoulder of Mount Mansfield. Smugglers’ Notch Resort , lovingly referred to as ‘Smuggs’ by locals, was named the “Number One Kid Friendly Resort in the East 2016” by Ski Magazine . Its family-friendly vibe will have all members of your family, from toddler to teen, in a happy state of being. Smuggs’ three mountains, eight lifts, and 84 runs offer a huge variety of terrain—ranging from beginner to expert—with an added option for backcountry skiing in Smugglers’ Notch . Located in Cambridge, the resort is a small village unto itself and offers numerous amenities, including plenty of options for lodging, dining, and entertainment, all within walking distance of the lifts. And the daycare here is top of the line, so parents can get out and enjoy the slopes while the little ones stay happy and toasty. If you’re a skier through-and-through, you may have just found your happy place at Mad River Glen in Fayston. To start, it’s one of only three skier-only resorts left in the United States. While you don’t have to worry about any run-ins with snowboarders here, you still have to stay on your toes because Mad River has some of the most challenging terrain in the area. The mountain’s five lifts and 45 runs all live up to the mountain’s famous motto, “Ski It if You Can.” If that’s not enough to bring a smile to your skiing face then maybe this will: Mad River is the only major mountain resort in America to be skier-owned and operated, and is home to the nation’s last remaining single chairlift. If you are willing to add a few minutes onto your drive, Sugarbush, in Warren, is one of New England’s largest resorts with 16 lifts and 53 miles of trail. Or, if your looking to head north, traveling about 90 minutes will bring you to Jay Peak, famous for being the mountain that gets the most snow on the East Coast. Written by Suzanne Loring for RootsRated. By the time I skied my 100th day this season—skinning up Alta at sunset after a rogue May storm dusted the mountain with a few inches of fresh snow—the outing felt both special and normal. Special because every ski day is a high-five from life. Normal because I’d spent the whole season getting re-accustomed to skiing multiple days per week like I did ski-bumming for many years. These days, I am a homeowner. I have a career; I have garden tools; I fill out weekly timesheets at work. But I found myself putting off too much of my weekly fun until Friday happy hour. Yes, I still skied every weekend and holiday, with frequent dawn patrols thrown in for good measure. But skiing, to me, is what tennis balls are to Labradors. So, realizing that my indoor days had grown a bit more frequent than my outdoor days, I felt a wistful pang in my soul. So, this season I decided to fully renew my vows with skiing and see what would happen if I balanced my full-time job with skiing 100 days, which is the elusive numeric benchmark at which a skier knows they’ve proverbially gone all-in. It meant balancing work and mastering life logistics—and, oddly, I often had to defend the way I chose to spend my time to people who see “priority” and “play” as separate line items on the schedule. Here’s what I learned—and how some of my hard-earned lessons might help other people trying to do a better job of getting out more. 1. There’s quality in the quantity. By doggedly committing to multiple dawn or dusk patrols per week, and skiing every single Saturday and Sunday between November and May, I rode through some amazing days and some laughably poor conditions. This gave me the opportunity to remember why skiing in any conditions is always more fun than not skiing. By pushing through all the cruddy and icy snow days, I was in strong shape to shred all day long on good days. The “bad” days just felt like training for the great ones—and they weren’t exactly a chore. Not with Passion Pit on the playlist, toddy in the Thermos, and swooshing to be done. I also found creative ways to take photos even when the snow was not prime for hero shots. I documented backlit clouds against the silhouette of the chairlift cables. I photographed the way raindrops looked on my goggle lens on the soggiest day of the season. I filmed a blustery storm rushing in and blanketing Solitude resort after it fell silent, closed for the season, with no one present but the mountain and myself. When you find quality in the quantity, you revel in the imperfections of any mountain day. The point is rolling with whatever the day brings, and photographing your adventures is a fun way to celebrate their uniqueness, warts and all. 2. Savor the rewards of getting out no matter what the weather. My friend Elizabeth and I hiked up Brighton in a wild spring lightning storm. We acknowledged that this didn’t align with safety protocol, but we were pretty sure the lift poles would get zapped first. Halfway up the mountain, we were drenched and ready to surrender. But suddenly the rainstorm subsided, the clouds parted, and we finished our adventure beneath an otherworldly, fiery sunset. If not for this 100-day goal, we never would have thought to go ski touring that evening, and that magical sunset would have never imprinted our memories. The bottom line: You’re outside. You’re so, so lucky. 3. Learn to embrace slap-happy exhaustion. As the season continued, I incorporated dozens of backcountry dawn patrols, dusk patrols, shared moments of inbounds play with friends, and mind-clearing solo outings into my quest. Soon I broke past the exhaustion barrier, and my energy picked up steam. I got used to skinning back-to-back days lugging a heavy pack. I made a game out of timing my mogul turns to the tempo of Scissor Sisters’ “Running Out,” repeating the exercise for hours on end, laughing at the fact that I was training so hard just for the sake of it, not for any particular event. And wouldn’t you know it: I got stronger as a skier and could push through big days without flagging. I was already a competent skier, but now I laid into my turns faster, more aggressively and confidently than I ever have before. 4. Become a master juggler. 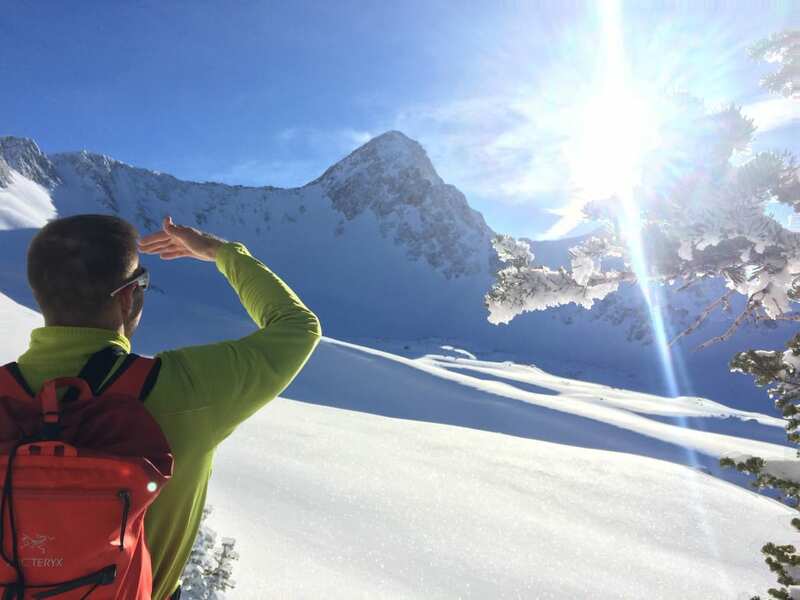 Scoping out the weather is an important component of a 100-day ski season. I generally mapped out my ski schedule a week or two in advance, studying multiple weather forecast websites and placing my bets accordingly. I found a few committed dawn-patrol comrades, and we decided together which days were most likely to be good. We all had to be at work by 9 am, so we were on the same strict timeline. Trailhead by 5:30, summit by 7:30, back to the car by 8, and rush off to work after a three-minute shower. These days always left us a little short on sleep, but we felt like we had a special secret coming into office meetings after sunrise powder turns. I set Saturdays, Sundays, and holidays aside to ski, heading to quieter backcountry enclaves on busy resort days. The day-job folks in the ski crew coordinated days of paid time off to line up with the snow forecast. Often, the bet paid off handsomely. Other times, storms came late or underperformed, leaving us using precious time off to ski dust on crust—then watch as others posted glorious powder shots on social media the next day when the storm finally set in. But in the end, all that careful planning was crucial in hitting my 100-day mark. The author tests performance denim on Solitude’s last day. Doing any one sport repetitively in your teens and 20s is no big jazz. But in your 30s and beyond, it calls for committed cross-training and stretching. Skiing four days a week was cause for my lower back to threaten mutiny unless I added two or three weekly yoga classes to my schedule too. This meant I was investing even more time to be able to ski, but it was well worth the effort. All this high-elevation activity also meant I had roughly the daily caloric requirements of an adolescent rhinoceros. I ate and ate and ate, carrying Thermoses of stew or macaroni and cheese in my backpack. I bought Kind bars in bulk and never turned down a glass of nature’s recovery drink, beer. My gear took a slightly heavier beating than usual; I broke three boot buckles and logged three visits to the shop to repair the core shots suffered by my ski bases. I ran my aging touring bindings into the ground. 6. Find support in unexpected corners. 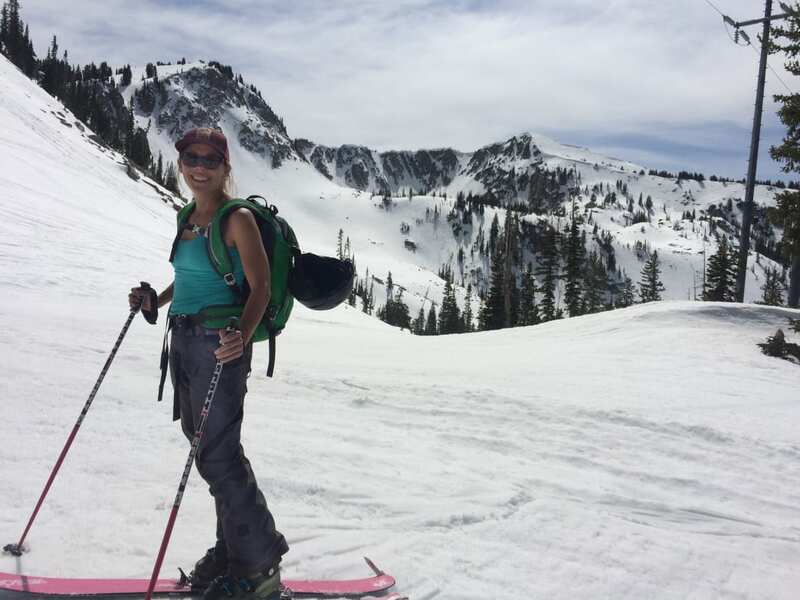 Jamie Engebretson takes in a little sun on a springtime tour in Big Cottonwood. I did have to defend or at least explain my 100-day ski season to some, but I was overwhelmed by positive support from many others in my life, some of whom don’t ski but were simply happy to watch me insist on having fun and see my goal to completion. Coworkers cheered me on with supportive comments on my Facebook page. My roommate pre-programmed our coffee maker the night before so it would help me wake up for dawn patrols. One friend told me she’s terribly intimidated by skiing but got a pleasant thrill from my accounts of high-up couloirs and chutes. And I realized along the way: Happiness isn’t an insulated emotion. It isn’t contained. When you’re happy, people around you are a little happier too. 7. Never underestimate the power of play. A hundredth-day bottle of champagne in excellent company. Ultimately, I sure slept less and multitasked more. But I insisted on spending a baseline amount of time outdoors doing something I care deeply about. Playtime is encouraged for kids, but as adults, we often cave to the notion that we just don’t get to do that anymore. We live lives with infrequent reprieve from tension, to-do’s, and screen time. But a miracle drug is out there—literally, out there. Outside. It’s where we blow snow off pine boughs just for the fun of feeling like a smoke-blowing dragon. Where we howl like coyotes at the bottom of powder runs. Where we crank the pre-game music in the parking lot. Where we get numb, dirty, tired, silly, runny-nosed, sore, and … fulfilled. Having hit my numeric goal, I’ve discovered the real goal that underlies it, which is prioritizing play amidst a full adult life. I’ll keep going out until summer shrivels the Wasatch’s last lingering snow patches. And I’ll await impatiently for next October’s snowflakes to fly. I may or may not carefully count my ski days next season, but prioritized play is definitely my new normal. The resort ski season may be winding down, but spring snowpack still clings to the upper heights of the Pfeifferhorn, Superior, Wolverine, and Coalpit. Spring can be prime time for hiking and booting up tall, steep lines with relatively low avalanche danger. Steep season is the new spring season. And to commemorate, we caught up with notable local pro skier Noah Howell for a steep ski clinic. Howell has made quite a name for himself by billy-goating up dangerously high and remote mountains, then descending them with a level of grace unpossessed by most mortals. He’s skied darn near everywhere, adventures he documents on his blog, but he mainly calls the Wasatch home. Over the course of a sunny afternoon on Mt. Millicent at Brighton, Howell shared a few of his go-to tips for sliding down things that scare you a little. Here are a few takeaways that just might help you up your game. Lesson 1: Steep skiing is all in your head. 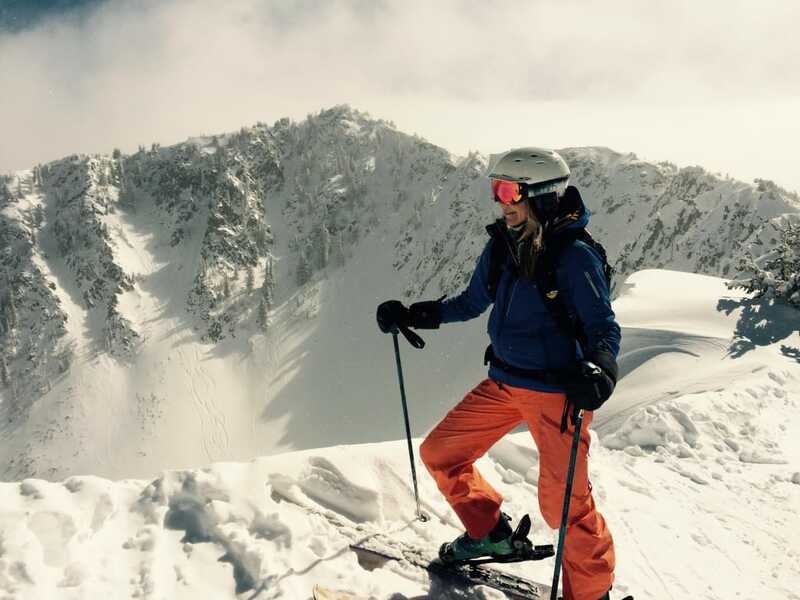 Howell advises starting where you’re comfortable when it comes to skiing steeps. “Steep skiing” can mean quite a few things, and it’s all relative. For some of us, it means staying in control on a narrow line inbounds. For other folks, it might mean a committed no-fall couloir in a faraway place where you have just your thoughts for company. So how do you overcome those scary thoughts when you’re trying to push the limits a bit? “Start where you are comfortable and safely work out of that by choosing safe lines free of rocks and trees, with clean run-outs,” he says. Lesson 2: Proper technique puts you in control. Eli Littenberg demonstrates proper technique on the steeps. At the top of a somewhat tight space between some small cliffs—not exposed, but good for practicing methodical, controlled hop turns—Noah demonstrated a helpful trick: shortening your ski poles a bit so they force you forward into an assertive stance, firmly in the driver’s seat. He bounced in place a little before initiating his turn, then used his upward momentum to drive his ski pole downward and swivel around it. The result: a perfectly controlled turn within a narrow space, executed with near-McLeanean precision. After a couple of practice laps hop-turning down Milly, things started to gel. You can make a sloppy hop-turn (slop turn?) expending all your energy jumping upward and turning in the air, or you can make a tighter, more efficient turn in which you press down on your pole, unweight your skis, and simply swivel around. Lesson 3: On high-stakes lines, everything matters more. The author assesses the terrain. When you’re skiing steeps, every movement you make is more consequential, with less room for error. You’re often in mixed conditions where controlling each turn is critical and you’re forced to adapt as you go. And keeping your cool is critical. But, speaking of scary, what’s the most gripped he’s ever been at the top of a line? “When I was in Baffin Island, we climbed a 3,500-foot virgin couloir to ski,” he recalls. “We found six inches of snow on top of ice towards the top, but it felt like it would stick and we could descend it. I worked my way down first and al the snow peeled off the 50-degree slope. I was left with my edges barely gripping the ice. I sat there frozen, waiting to blow it at any minute and go hurtling down the chute to my death. A final lesson from that anecdote: Never be too proud to sidestep. (And always wear your helmet.) Study the moves of people who are better than you. And call your mom at the bottom of the run. With the arrival of warmer temperatures and a more laid-back atmosphere, spring skiing is a magical experience: costumed characters barreling down the slopes, sundeck moments toasting the fun at all-day après, and savoring that seasonal favorite of conditions, corn. 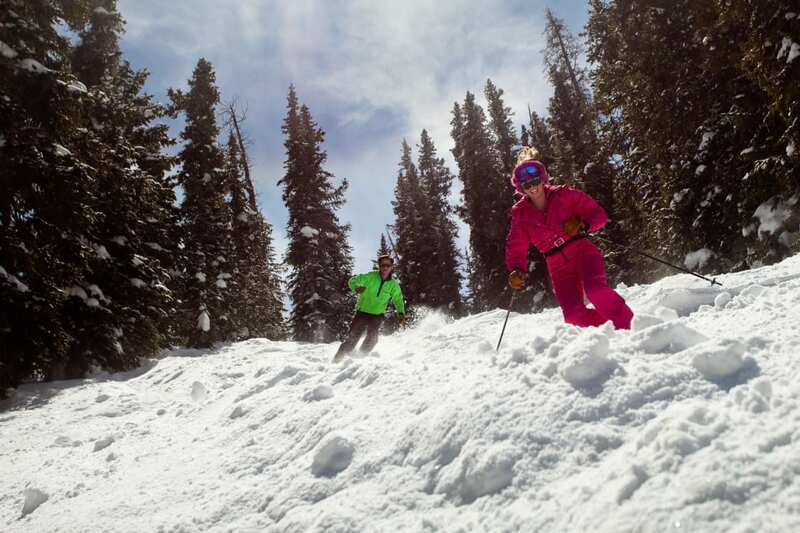 Whether you’re looking for family fun during a spring break with the kids or a spirited getaway with friends, here are seven spots in North America for the best spring skiing that deliver an experience to remember. 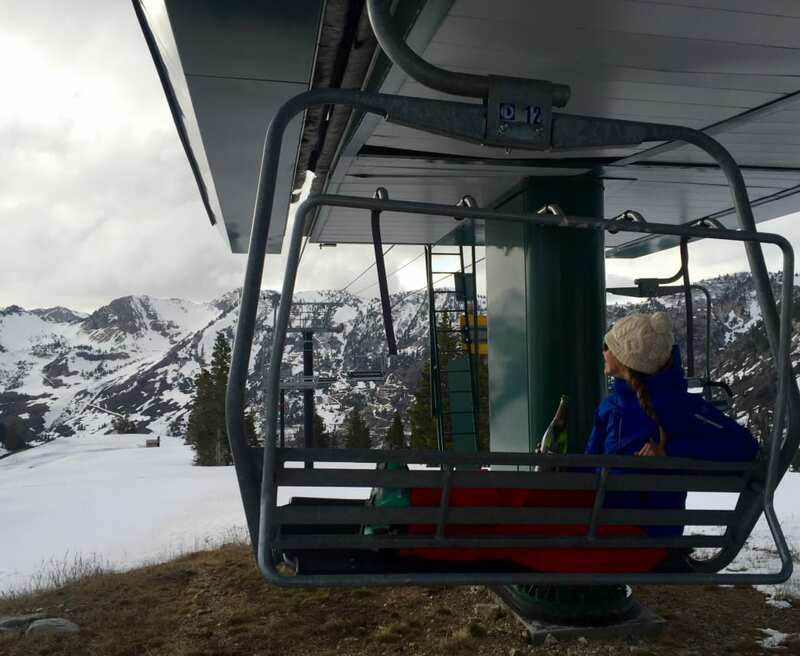 An easy drive from Salt Lake International Airport, Park City is a delightful resort that provides plenty of on- and off-slope fun for everyone in the family. Beginners and accomplished powder junkies will find options galore on the 7,300 skiable acres of terrain. Meanwhile, daycare and private and group lessons tiered to age and abilities (and starting at a wee three years old) help little ones and older kids build the confidence to develop skills, while giving mom and dad some time of their own on the slopes. When the lifts close, the village’s cozy restaurants keep the smiles going. One of the perks of spring skiing? Après that lasts all day, like the round-the-clock party at Mammoth. The magic doesn’t just happen on the slopes in this culinary savvy ski town: It’s also found in the 100-plus restaurants spanning all types of genres, from barbeque joints to international fusion. Longtime favorites like Sweet Basil are must-do spots, while newcomers including the Craftsman and Matsuhisa have kept up the city’s food scene on-trend and always relevant. For an even deeper dive into the town’s culinary roots, check out the annual Taste of Vail festival. Whistler Blackcomb is one of the world’s top resorts, as well as the largest in North America. But aside from its magnificent slopes, the village packs a punch when it comes to après-ski and nightlife. Its pedestrian-only alpine village is perfect for bar-hopping between classic watering holes like Merlin’s Bar and Grill, Garibaldi Lift Co. (known among locals as GLC), and Dubh Linn Gate Irish Pub, to the late-night club scene found at Maxx Fish, Tommy Africa’s, and in the underground at Garfunkel’s. And the Whistler World Ski & Snowboard Festival, which is scheduled from April 10 to 15 in 2018, all but guarantees as hard a party off the slopes as on. This mighty peak and resort stands as a defining stratovolcano in the middle of Oregon, with a ton of fun skiable terrain and gorgeous views. And—a big plus for beer connoisseurs craving world-class pints for après refreshment—it’s a short drive from the brew mecca of Bend and its 19 breweries. From the iconic Deschutes Brewery to the hoppy creations of Boneyard Brewery, there’s something for everyone in this buzzy scene. Most breweries are open for tours, but Bend’s ale trail tours offer self-guided exploration of brewery stops—a justifiable reason for missing first chair the next day. Mammoth Mountain, California, is a favorite for springtime skiing and a prime spot to catch some rays while you hit the slopes. The Eastern Sierra Mountains in the spring are a delightful mix of snow, sun, and, at this SoCal favorite, an enticing array of terrain park features. 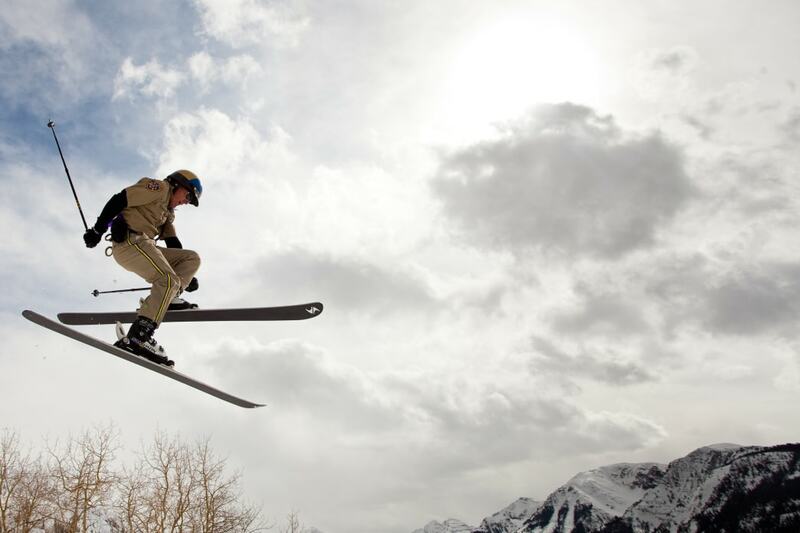 The Unbound Terrain Parks of Mammoth have been built up on a ton of creativity and innovation that help to make them one of the best spots for terrain parks on the continent. Five parks, a 22-foot superpipe, and multiple jib and jump lines ensure you’ll discover something exciting to spice up your ski or snowboard chops. And you’ll have plenty of time to savor all this action, since Mammoth’s season stretches as far into the year as June. Jackson Hole Mountain Resort is infamous for Corbet’s Couloir—a double black diamond, 40-degree pitch that can be entered through tantalizing big air drops or through a steep, narrow slot. But if Corbet’s is a tad too ambitious, there are numerous other ways to test your mettle on the 54 black diamond runs and 21 double blacks that comprise about 50 percent of the resort’s terrain. From the Aerial Tram, you can witness many of these expert lines, from the couloirs off of Headwall to the classic side country off of Cody Peak. Known as A-Basin among locals, this Rocky Mountain resort has some of the highest-elevation skiing in North America at 13,050 feet, as well as one of the longest seasons, from October through June. But beyond that, Arapahoe Basin has earned fame for its memorable tailgate experience. From March until closing day, the parking spots that line the resort transform into spirited shindigs, with resort goers sporting funky gear, onesies, and sometimes no shirts at all. BBQ’s, music, and ski-in ski-out service mean prime time for socializing and fun, both before and after hitting the slopes. Written by Trevor Husted for RootsRated. 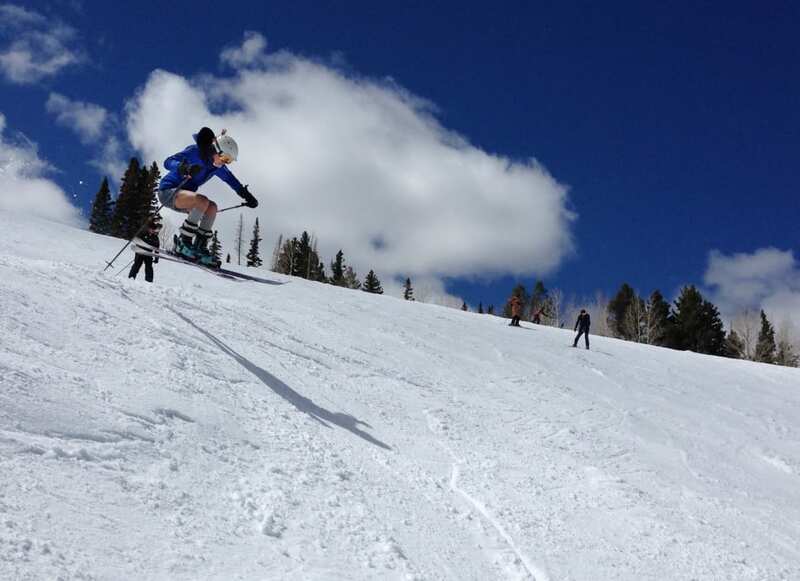 Spring calls for the two-hour ski day and four-hour tailgate program. At many resort parking lots and base areas, this means you’ll want to come ready with a portable barbecue, grillables, a cooler full of drinks, camp chairs, and snacks. Bonfire supplies would not be inappropriate.